We have walk paths that lead from most tees to the fairways. In some cases, these paths seem like a convenient path for carts to drive to the fairway as well. Signs have now been placed at these paths directing carts around the walk paths to reduce wear and tear. Please check out the short video below regarding this issue. Cicada Killer, saw my first tunnel in the past couple of days. 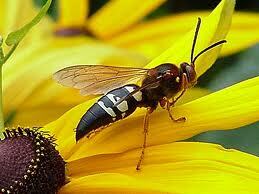 The last half of summer is arriving and along with that are the Cicada Killer Wasps. I saw my first cicada killer den into the side of one of our new bunkers in the past couple of days. Also, they like to burro into the sides of some of our greens surrounds like #3, 5, and 17. They will also tunnel on flat ground as well. Between 16 and near 17 green surround are one of their favorite areas. Dr. Rick Brandenburg from North Carolina State has an informative video below discussing these insects. We will normally treat the run with a sprayable insecticide or a powder. Not a lot we can do about the ones buzzing around the greens and bunkers, sans getting a tennis racket and knocking a few out of mid-air. 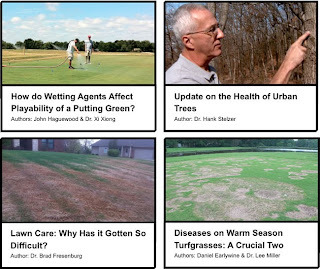 Our local superintendent association, The Mississippi Valley Golf Course Supt Association(MVGCSA) started an initiative last season to raise additional funds for turf research other than our normal yearly golf outing. The research that takes place at University of Missouri can directly effect in a positive way the quality of the turf conditions you experience here @Glen Echo CC. Current studies include bermuda grass removal from zoysia fairways, poa annua treatments on greens and other important work that is ongoing at our state university. $ 10 each. The drawing will be held on September 9th and winners will have 1 year to get their round in. I will be happy to take either cash or check made out to MVGCSA Keep It Green. Thanks ahead of time for your support of this worthy cause!! I did some editing of the original video from last week's aeration work and placed some short clips of the rest of the process at the end. I will try to incorporate more video in the blog as time allows. Maybe purchase a camera instead of using my phone which is convenient but does not make the best movie clips. We still have just a few things to aerate. 6 approach as well as a few more of the last 20-30 feet of some of our greens approaches will still need some work. The long range tee needs to be cored and will still plan on doing a solid tine to both our warm season and cool season tees. A rain event like this morning gives us an opportunity to do some things around the facility that maybe have not been completed for a while or some regular maintenance on equipment. This includes cleaning equipment with our power washer/steam cleaner. sharpening blades, check equipment fluids, making green sand, cleaning off our flat building roof from debris which clog up the down spouts and general straightening/ clean up. If its a long rain event for 3-4 hours, we do our work and then begin to send staff home based on newest employees first. In some cases, the regular staff chose to go home as well if they need to catch up on their work or home. We also go on the course to check drain lines and see how the course is responding to the rainfall to give us an idea on when we can open up the facility. Brown sand waiting to be dyed into green sand. Tom on the roof cleaning debris from down spouts and roof to prevent water from coming into the builidng. Over the past few days, we have applied the most irrigation to our course for the season to date. Lower humidity, less rainfall and fairway/tee aeration caused an increase in usage. We attempt to manage our lake recharging using city water very judiciously because of the cost to the club and waste of natural resource if it flows over the spillway and goes to New Orleans down the Mississippi. The 1" of rain saved the property over 3,000,000 gallons of water plus will probably recharge our lake for usage later in the week when we begin to dry out again. Every day we do not run the lake tap as we call it is a day of savings. For your information, we pay 2.57660 plus 17% taxes per 100 cubic feet of water which is 748 gallons of water at a cost of .00403024 cents per gallon. Million gallons of water is $ 4,030. During the heaviest irrigation cycles, we can run through a million gallons in 3-4 days. 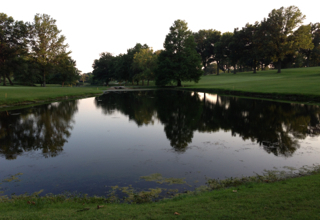 Lake is usually full when it reaches the bottom of the spillway that leads from the lake near 15 tee. Water is still rising on the spillway leading from the lake on 15 but has room for more water. Planning on completing at least 15 and 16 this morning with our fairway coring. Hydrojecting this morning with 3 machines from E&E Enterprises. Should not interfere with regular tee time play. Early birds, that's another story. Darkness is falling on Glen Echo and our fairway aeration has been completed for the day. We were able to get through hole #13 today. Sounds like the weather is not great for trying to knock out maybe #15 and another hole tomorrow but we will see when we get up in the morning. Check out the video below with some discussion of the work that was accomplished today. I will have a little more time to put together some additional details for you over the next couple of days. I was kind of right in the middle of the action today so not a lot of time for pictures etc. As you know, we used about a ton of compost on a few tees on the course. I have noticed disease activity and the lack thereof on the 2nd tee which we split in two for a composting experiment this season. For today's purpose of this blog, the sides of the tee I am talking about are looking back at Hole #1 with the metro tracks on the left side of the tee. Normally I discuss things in direction the hole plays but my picture is laid out differently. The overall health of the composted section is definitely improved from the check area on the right. The right part of the tee has developed some Dollar Spot which is a fungus. The composted section of the tee has no dollar spot. Without any actual testing of the soil, I would expect the composted side to have improved beneficial microbes which hold down the population of dollar spot microbes. Also, dollar spot is also attributed to a turf that is lacking nitrogen which can help to out grow the disease activity. Click on the link above for additional information. There is a large amount of Brown Patch which is a fungus as well on the check side. The dollar spot and brown patch were severe enough on the check side of the tee that I had to spray it with fungicide today to get them back in check. I am trying not to spray the compost side for brown patch but if it continues to worsen, I might have to break down and spray it. With increases in humidity, you are seeing more of these two diseases active on the types of grass that are susceptible. Fescue, bentgrass, poa annua, blue grass and even warm season grass such as bermuda and zoysia are showing some dollar spot activity. High humidity levels increase the activity level of these two diseases. #2 tee looking back toward #1. The composted side is to the left. Its overall appearance is better than the right. It has more disease activity, has been requiring fungicide applications every few weeks. This is a picture of brown patch which is below my phone holder. These are areas that have rings ranging in various sizes. It has a washed out look and can cause thinning and overall weakness to the plant. Fairly simple to treat with fungicide. It can also be checked by changes in weather such as cooler and dryer weather. There is also a cool season brown patch which can be seen in the winter, fall and spring. To the left of the phone holder is dollar spot mycelium that are attacking some poa and bentgrass on the weak side of the 2nd tee. It gets its name dollar spot from the fact that it is about the size of a silver dollar. We will be aerating our fairways beginning Monday morning weather permitting. It usually takes us three days to get everything completed. We do a majority of the work on Monday and then do a couple of fairways each day on Tuesday/Wednesday depending upon what is left. We will be using two aerators on Monday. The actual aeration goes fairly quickly but it is the clean up the takes the most time. We will be using our flail unit to break up the cores and then drag behind it. The fairways are blow off and then mowed. The aeration can take around an hour depending upon the size of the fairway and the clean up process can take 1.5 to 2 hours to complete. The biggest issue we have is dealing with dew that slows down the drying process and usually delays the beginning of our clean up until about 9-10 a.m.
We will also be aerating the zoysia surrounds with our rough aerator and will need to do the red tees and range tees with our verti-drain machine. Not sure if mother nature will let all this work happen but we will try. We appreciate your patience during this most important process. We would have started our warm season core pulling aeration on Monday but the surfaces were too wet from Sunday night rainfall. We are pulling a 1/2" core at about 2" in depth to reduce thatch on our tees with our verti-drain machine. Not sure if we will be completely finished today with the heavy dew we are experiencing and avoiding disrupting any play that is taking place. We are doing parts of combined tees or doing individuals tees to insure that you have a clean place to tee your ball from while we clean up the debris. Once the area has been cleaned, we will then come back in and do the remaining tees as needed. We will also use the same machine but will place a 1/2" solid tine on it which will give us a much deeper hole. This will allow the tees to drain much quicker and will improve root health. We also plan to topdress the tees with sand which will get into the holes and will assist in removing excess moisture from the tee surface. It will smooth the teeing surface over time with additional applications. They will be slightly drier on the surface because the sand will allow moisture to move into the profile quicker and will make for easier penetration of tees being placed in the ground. See the video below for additional information. fall and through to mid-summer have hopefully put our bentgrass/poa greens in a position to be healthy and survive the rest of the summer. We will now be taking a number of additional steps to protect our turf from this onset of extreme weather that can potentially set in for the next few weeks. We did a slight raising of our greens mowing height today. Our walking greens mowers were at .130" which is just barely above 1/8" and will be raised to .135" which amounts to a 3.8% increase. Just a slight increase in leaf tissue will provide positive increased health to our greens as they begin to suffer through increased ambient and soil temperatures. Additional leaf surface leads to the potential for more energy production for an already weakened plant. We will begin to alternate between rolling greens one day and mowing the next in the early part of the week to reduce damage to the plants. Mowing creates a wound on the tip of the blade which then requires additional plant energy to be produced to heal the wound. Studies have shown that alternating between mowing and rolling reduces the overall energy required by the plant without sacrificing overall green speed. We will attempt to place an additional roll or two on the greens on Friday/Saturday which will improve ball roll for the weekend. 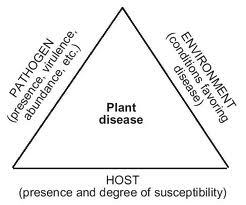 The disease triangle to the left shows the three factors that must come together to create disease in plants. The host at the bottom of the triangle is our bentgrass/poa being mowed and played upon at 1/8" and are very susceptible to disease during the heat of the summer. In some cases, the disease infects parts of the plant during the fall and or spring and if proper maintenance and or treatments are not made, the potential for the disease to explode are possible. The plants are being grown at a height and in an area of the world where they are not native thus susceptible to certain diseases. The environment on the right side of the triangle are conditions favoring disease which we are beginning to face. High temperature and humidity. This can include high night temperatures where soil temps are not allowed to cool overnight. Humidity can come in rainfall at the worst time such as an mid-morning deluge followed by over 90 temps. The third part of the triangle is the pathogen which is almost always in the soil but its numbers are not to the level where it can impact a plant. As environmental conditions deteriorate, the pathogen explodes in numbers and over runs the good microbes in the soil and the ability for the plant to defend itself and the onset of disease occurs. One of the things we are trying to do is reduce our activities on the turf which can encourage disease or stress to the turf. At the same time, we walk a fine line in reducing inputs to the turf without compromising your overall ability to enjoy playing on this surface. This is a difficult task to balance between these two factions. The enjoyment of our members and guests of their day on the course is foremost in our minds. At the same time, we must manage the health of our most important resource at the club which is our golf greens in a way to protect them through this stressful period so we can enjoy them for the rest of this season and the future. Other jobs such as hand watering greens will become more apparent over the next few weeks as needed to supplement irrigation and cool surfaces when warranted. Chemical input intervals could be shortened slightly over the next few weeks and additional products including seaweed extract will be increased to improve heat stress resistance. Additional applications of Turfscreen will be applied which is a sunscreen for turf and reduces overall canopy temperature. Plant growth regulator Primo will be used which helps to reduce overall top growth of the plant which saves energy consumption as well as reducing top growth which improve ball roll on the non-mowing days. Hydrojecting and needle tine venting will take place over the next month as well. Another hydroject venting is scheduled next Tuesday, July 23rd and we will then follow up with a needle tine venting with our verti-drain machine in mid-August. These two processes open up the turf to exchange good gas(OXYGEN) for excessive bad gas which is (CARBON DIOXIDE). All living things need carbon dioxide but too much can be fatal. The holes also help to dry wet areas and allows moisture to get into areas that tend to stay on the dry side. 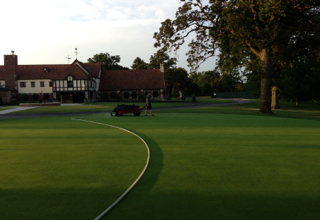 We've been applying wetting agents and penetrants to assist in moving water through the 4" sand layer of our greens. This material helps to reduce Localized dry spots(LDS) which is why you might see us concentrating water with hoses on specific green areas in attempting to get moisture to penetrate these areas that repel water. Probably the most important thing that I have done in my 23 year career took place two seasons ago last summer when I changed our greens mowers over to solid rollers permanently. Our old practice like many others was to change to solid rollers from grooved rollers during the main stress of mid-July/August. I decided because of the age of our greens, poa contamination, lack of drainage and improvements in plant health/ball roll with solid rollers to make our switch permanent. Wiele or grooved rollers do help cut the turf tighter but it also puts severe stress on the turf grass plants and the green surfaces. We are cutting at a slightly higher height than a few years ago but achieving just as good if not better ball roll and at the same time improving the overall health of the greens. We've had the worst algae bloom in #10 lake over the last week that I've seen since I've arrived at Glen Echo. We apply a microbe product to help clean up the leaf/organic debris that accumulates in the lake. I was late in getting the microbes placed in the lake this season. The staff did some mechanical removal of the algae today using a rope which was pulled along the surface of the water moving the algae to the spillway end where it was then pulled out of the lake with rakes and hauled to the dump. Staff pulling the ripe across the surface. Picking up the material so it can be hauled away. Final look this evening. It looks much better. 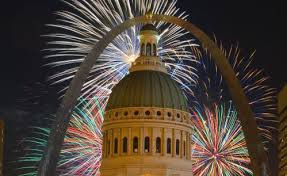 Sorry about the incorrect info on TKO at the pool on July 4th. They will be there on Saturday July 6th. Cross advertising is great if you get the dates correct!! 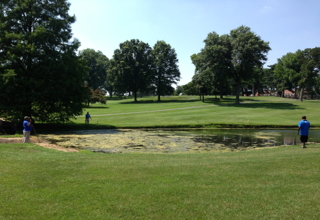 Should be a great weather day today with a high of 85 to enjoy all we have to offer at your great club Glen Echo. Activity on the course with regular tee times through the morning and the 4th of July Scramble in the afternoon. CARTS ARE OFF THE PATHS The pool has TKO DJ all afternoon with buffet available as well. The evening is set with a great barbecue planned by Chef Terry at 4:00 p.m. Staff will be doing a number of things this morning to prepare your course for you. Mowing Fwys and greens, rolling greens, raking bunkers and changing holes are planned and then the staff will get out of your way and go enjoy the rest of their holiday. They will be back at it Friday all day preparing the course for the weekend. Cool weather not only allowed us to topdress greens yesterday but we were able to brush them with the cocoa mat brush and also mowed them. Usually during hotter periods of summer, we stay away from brushing because of the bruising and stress it can do the turf. With cooler temperatures we were able to brush one more time before we lay off this practice until mid-August. Topdressing helps to smooth our surfaces, mixes sand with dying plant material(thatch), and provides protection for the crown of the plant. Since our greens do not have internal drainage(except for 9), it does improve drainage by increasing the depth of the sand which the water travels through to evacuate through the bottom of the green/soil profile. Skip applying a light layer of sand ahead of brushing. Our driving ranges are there for your use and we expect and are required to perform regular maintenance. Aerification, mowing, fertilizing, divot filling and topdressing are required to keep the turf as smooth as possible and in good shape. There is one area in which our golfers can greatly influence how quickly our turf fills back in from a practice session. Long lined divots or rows from the front of the practice tee area to the rear are preferred than taking the turf completely out of a 2x2 square. 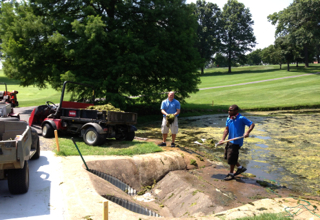 When watching the pros practice at a tournament, they remove almost every blade of grass. This is not the example you should follow. They do this type of pattern because there are 150 people hitting balls over a 5-7 day period. The range tee after a tournament stop needs to be completely renovated because of the amount of divots removed. Check out the video below regarding divot patterns that we prefer you take at Glen Echo CC.